An encounter with nearby nature can help alleviate mental fatigue by calming and restoring the mind. Parks and green spaces are settings for cognitive respite as they encourage social interaction and de-stressing through conversation or exercise as well as provide calming settings. It has been scientifically proven and researchers have found that smelling roses and pulling up weeds can lower one's blood pressure, increase brain activity and produce a general upbeat feeling. The evidence is undeniable that the health factor has been given its own name - horticultural therapy and is being used to treat hospital patients and to even calm prisoners in jails. Getting involved in gardening can be as simple as going for a walk in a garden with a friend or creating your own small pot garden. • Gardening might also bring out greater feelings of spirituality and could even offer relief from traumatic experiences such as dealing with the death of a loved one. • Research has shown that people, who grow their own produce, consume higher levels of nutritious fruits and vegetables. • Spending time in natural environments makes people better at doing their jobs and also increases energy levels and feelings of vitality. • Being around natural environments improves the ability of children with ADD to focus, concentrate and engage more with their surrounding environment. • People who spend more time outside in nature have better mental health and a more positive outlook on life. • Plants calm human beings and provide a positive way for people to channel their stress into nurturing. 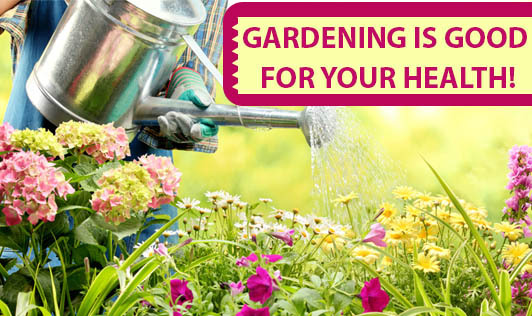 Now that you know the health benefits of gardening, would you give it a try?